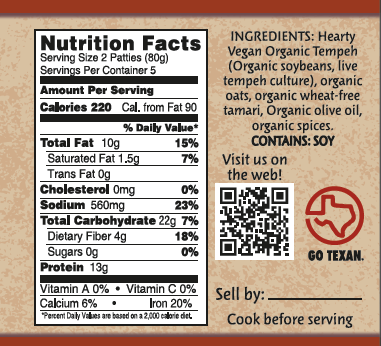 Mild Tempeh Sausage is made with 100% organic ingredients and certified Gluten-free oats. These breakfast-style patties are great in the morning with hash browns and scramble, or as a snack crumbled on pizza. Sometimes when I’m in a rush I will toss a couple patties in the toaster with some bread, then eat with vegenaise and lettuce. Delicious! These also work well to make southern style ‘sausage gravy’ with biscuits.